The US says it has no plans to remove the debris left over from depleted uranium (DU) weapons it is using in Iraq. It says no clean-up is needed, because research shows DU has no long-term effects. It says a 1990 study suggesting health risks to local people and veterans is out of date. A United Nations study found DU contaminating air and water seven years after it was used. DU, left over after natural uranium has been enriched, is 1.7 times denser than lead, and very effective for punching through armoured vehicles. When a weapon with a DU tip or core strikes a solid object, like the side of a tank, it goes straight through before erupting in a burning cloud of vapour. This settles as chemically poisonous and radioactive dust. Both the US and the UK acknowledge the dust can be dangerous if inhaled, though they say the danger is short-lived, localised, and much more likely to lead to chemical poisoning than to irradiation. But a study prepared for the US Army in July 1990, a month before Iraq invaded Kuwait, says: "The health risks associated with internal and external DU exposure during combat conditions are certainly far less than other combat-related risks. "Following combat, however, the condition of the battlefield and the long-term health risks to natives and combat veterans may become issues in the acceptability of the continued use of DU." A Pentagon spokesman, Lieutenant-Colonel David Lapan, told BBC News Online: "Since then there've been a number of studies - by the UK's Royal Society and the World Health Organisation, for example - into the health risks of DU, or the lack of them. "It's fair to say the 1990 study has been overtaken by them. One thing we've found in these various studies is that there are no long-term effects from DU. "And given that, I don't believe we have any plans for a DU clean-up in Iraq." The UN Environment Programme study, published in March 2003, found DU in air and groundwater in Bosnia-Herzegovina seven years after the weapons were fired. The UN says the existing data suggest it is "highly unlikely" DU could be linked to any of the health problems reported. But it recommends collecting DU fragments, covering contaminated points with asphalt or clean soil, and keeping records of contaminated sites. Reports from Baghdad speak of repeated attacks by US aircraft carrying DU weapons on high-rise buildings in the city centre. The UK says: "British forces on deployment to the Gulf have DU munitions available as part of their armoury, and will use them if necessary." It will not confirm they have used them. Many veterans from the Gulf and Kosovo wars believe DU has made them seriously ill.
One UK Gulf veteran is Ray Bristow, a former marathon runner. In 1999 he told the BBC: "I gradually noticed that every time I went out for a run my distance got shorter and shorter, my recovery time longer and longer. "Now, on my good days, I get around quite adequately with a walking stick, so long as it's short distances. Any further, and I need to be pushed in a wheelchair." Ray Bristow was tested in Canada for DU. He is open-minded about its role in his condition. 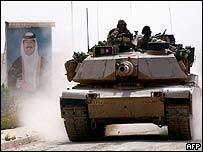 But he says: "I remained in Saudi Arabia throughout the war. I never once went into Iraq or Kuwait, where these munitions were used. "But the tests showed, in layman's terms, that I have been exposed to over 100 times an individual's safe annual exposure to depleted uranium."